I have just posted on the Pleasant Valley Conservancy website a new Power Point presentation (converted to PDF), that provides an overview and brief history of PVC. You can access this through the web site, or directly through the link below. This was something that Kathie and I put together for a garden club presentation several years ago. I should have posted it then, but somehow lost track of it. Here is the link to this presentation. This is the time of year when white indigo (Baptisia alba) seed stalks break off and blow away. They act like "tumbleweeds", getting blown across the prairie. The seeds of this legume are heavy, but many of them remain in their pods for long after maturity. Thus, their behavior seems to play a role in seed dispersal. Once the stalk breaks, the seed head becomes top-heavy, ensuring that the seeds get placed near the soil where they can do the most good. All it takes is a strong wind to carry these seed stalks far from where they have started. It's neat to watch them rolling across the prairie. Plants of quite a few species are dispersed as tumbleweeds. Most are found in farther west, in the Great Plains and deserts. As far as I know, white indigo is the only species of the midwestern prairies that acts as a tumbleweed. 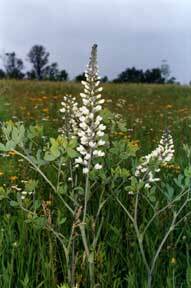 The other species we have, cream wild indigo (Baptisia bracteata) is built closer to the ground and is not a tumbleweed. White indigo is a very showy plant (C value of 8) and is highly desirable in tallgrass prairies. It prefers mesic sites, although we also have lots of it in our more open oak savannas. Fortunately, it is fairly easy to get established. At Pleasant Valley Conservancy we have a remnant population of white indigo on the North side of Toby's Prairie. This population was in an area that just escaped the plow (in the days when Toby's Prairie was an ag field). We collected and seeds and planted them in most other areas of the Conservancy. Although it takes a few years for them to get started, once they are going they take care of themselves. This is the time of year to be thinking about spring burns. We have been burning at Pleasant Valley Conservancy for almost 20 years now, and the program set out below is based on our experience. We've learned a lot from doing burns with TNC, MAS, Dane County Parks, and TPE. But we've especially learned a lot from our own burns. I've always taken careful notes of each burn, and made a detailed map and narrative. I started using GIS eight years ago, and this has been very helpful for creating professional-looking maps of burn plans and burn results. 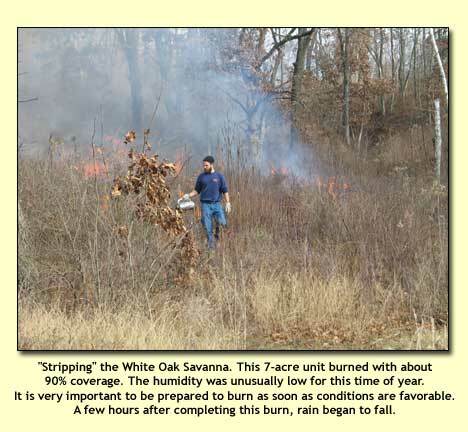 When we started prairie and oak savanna restoration at PVC, we made the mistake of burning before doing any significant brush removal. (We were poorly advised.) Fortunately, those early burns were almost completely ineffective, since there was nothing to carry a fire. 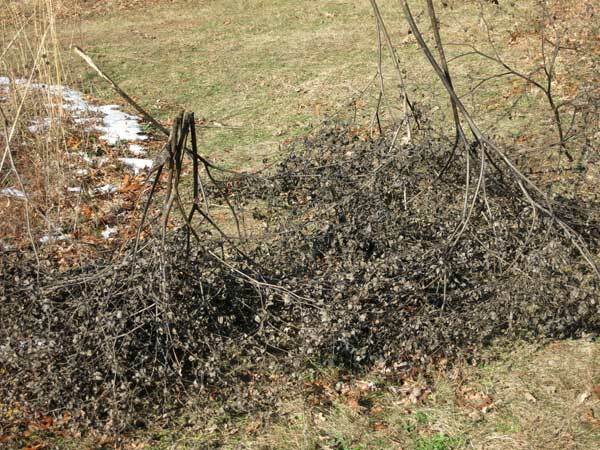 I say "fortunately", because if they had been successful, all those large buckthorn and honeysuckle plants that would have been killed would have resprouted large numbers of new shoots, making them lots more difficult to eliminate. We did have successful burns of two small prairie remnants that had no brush problems. Fortunately, our tree and brush control program got ahead of our burns. If the fire doesn't carry well because of sparse fuel, force it to burn by doing extensive interior lighting (stripping; see photo below). Once the site is well established (but not too soon) switch to a period of 2 burn years followed by 1 off year. The off year is to give the residual brush (which will certainly still be present) a chance to get big enough so that it can be easily found and killed with herbicide. Basal bark herbicide is probably the best, since it can be done 12 months of the year, although large clonal patches are probably better cut with a brush cutter. Be sure to treat every cut stem. The above protocol should be modified depending on conditions, but the basic rationale should remain the same. For a large site, it is best to restore small units (5-10 acres at most). Go to this link for an 18-year summary of burns at PVC. This post is based on thoughts arising from an extensive blog post of Steve Packard's, which can be found at this link. "Our true natural areas are often tiny remnants in seas of corn, brush, or development. What's the best management for such treasures?" Packard presents three hypotheses that I list below. He discusses each one, indicates that none of them are based on significant research, and notes that little testing is going on. "Some people argue that individual managers should be empowered to follow their own preferences." "...as staff and stewards come and go, new people change the protocols...."
"Hypothesis A: The best approach is to save the best there is---and then leave it alone as much as possible." "Hypothesis B: The best approach is to save the Grade A and B sites and restore them---and as much land around them as possible." "Hypothesis C: One good approach is to find large Grade C's (preferably with some high quality remnants included) and restore full diversity." 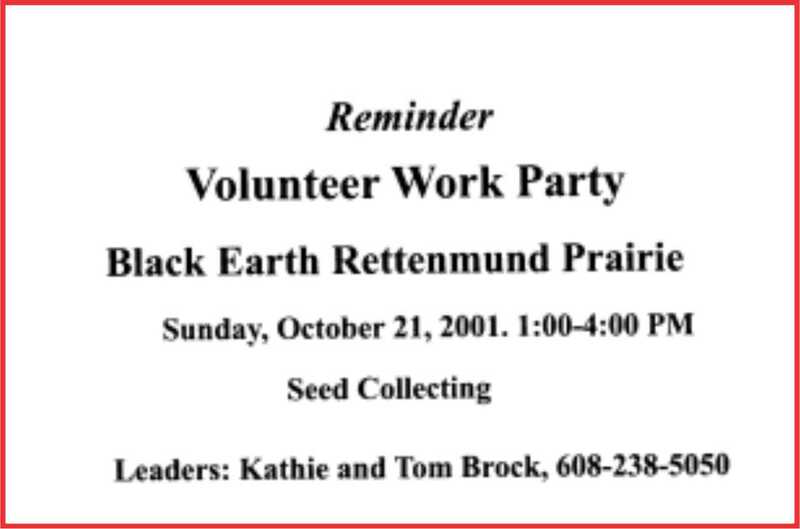 Black Earth Rettenmund Prairie is one of our better remnants and certainly a Grade A. It is also one that I am very familiar with because Kathie and I have been managing its restoration since 2001. In the early years, the Nature Conservancy had used a modified version of Hypothesis A. Save the best there is, but carry out frequent burns and extensive woody plant control. Also, some limited herbaceous weed control (wild parsnip only). When Kathie and I took over, we continued the brush control work, but also initiated extensive herbaceous weed control, not only wild parsnip but (especially) sweet clover. We had wild parsnip gone in a few years and sweet clover greatly reduced (although unfortunately still with us). 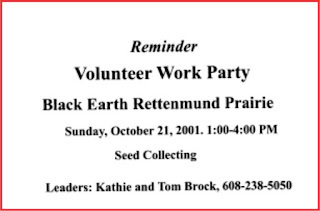 But as the work party announcement shows, we immediately started a major effort in seed collecting, with the seeds used on areas where brush had been removed. Note that only seeds that are collected at BE are used here. There is no introduction of new species. The activity is called "interseeding" or "overseeding." There are lots of great ideas in Steve Packard's blog post, and I strongly recommend that it be read! The new Monarch butterfly initiative of the NRCS is focusing extensively on milkweeds. Monarchs lay their eggs on milkweeds, where their caterpillars grow and pupate. Three species of milkweeds seem to be of prime importance in our area: Asclepias syriaca (common), A. incarnata (swamp), and A. tuberosa (butterfly). Because common milkweed is so easy to grow, and has a wide range of habitats, most of the work is on this species. At Pleasant Valley Conservancy we have lots of milkweeds (seven species, to be exact). Not surprisingly, common is the most common! However. Although it does grow in our prairies, it really flourishes in several of our oak savannas. Who knew that this prairie plant "prefers" savannas? For the past two years Kathie has gone "all out" to collect common milkweed pods for a Monarch initiative at Madison Audubon Society's Goose Pond Sanctuary. In 2014 she collected over 4000 pods and in 2015 over 1000. Since each pod has more than 100 seeds, this gives some idea of how many seeds she has collected. The seeds from these pods are removed and cleaned by MAS volunteers, and the seeds then get distributed to new prairie sites at GP. 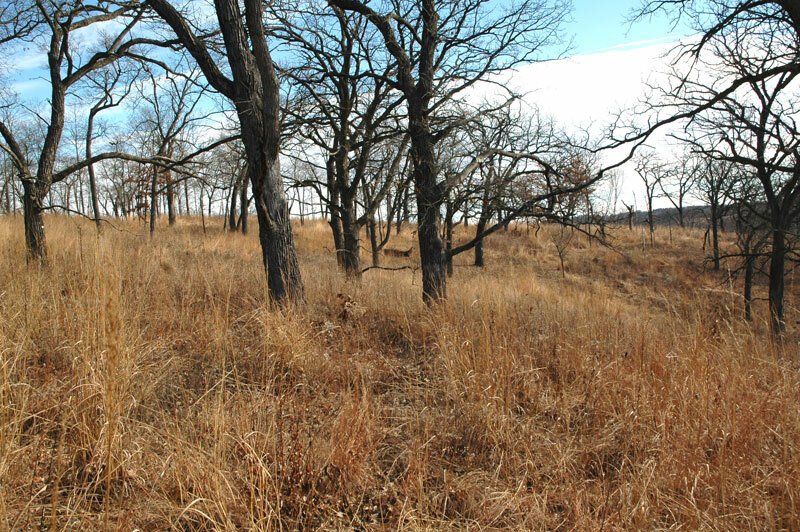 The site shown in the photo is one of our outstanding oak savanna habitats and one of my favorite sites. We usually stop here on our field trips for a lengthy discussion of how oak savanna restoration activities work. 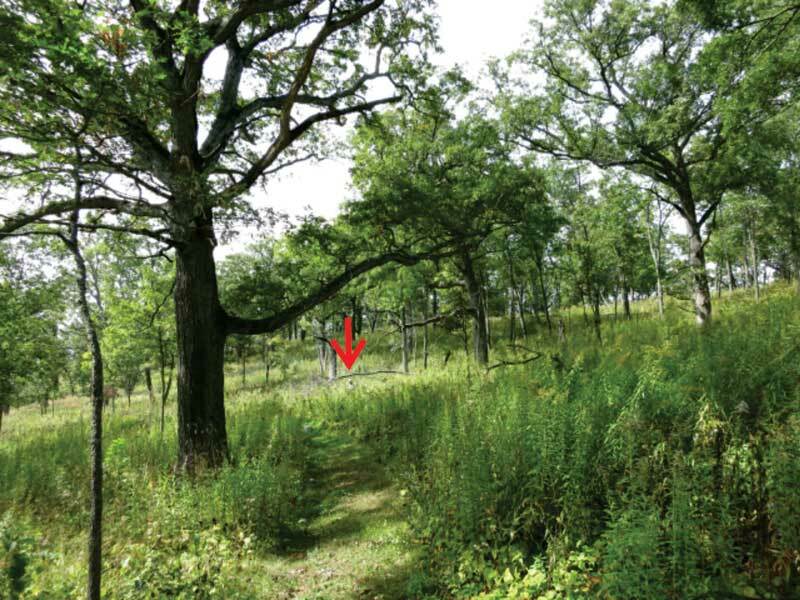 This location is easily reached from the trailhead by crossing the Pocket Prairie and walking uphill to the trail junction. Here you are in the midst of venerable open-grown white oaks that have been here at least since the 1850s. Among other things, colleagues of entomologist Prof. David Hogg have been using this same site as a convenient location for collecting eggs for their Monarch cultivation project. One of the reasons Pleasant Valley Conservancy (PVC) is so scenic is because it is in the "heart" of southern Wisconsin's famous Driftless Area. The rugged hills exist in our area because they are capped with an erosion-resistant rock type called the Oneota Dolomite. Underlying the Oneota is a less erosion resistant formation called the Jordan Sandstone. Both the Oneota and the Jordan have outcroppings at Pleasant Valley. Back in 2002 we were fortunate to have geologist Bob Dott visit PVC and create for us a geological cross section. Bob and I covered the whole Conservancy and he located the various rock layers. 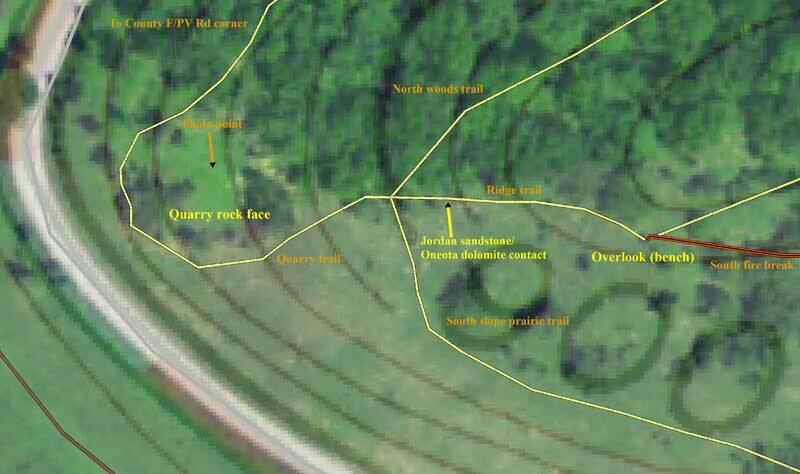 ArcGIS map of the west end of PVC, showing the various trails. The easiest place to see the Jordan Sandstone is the large outcrop in the Quarry. 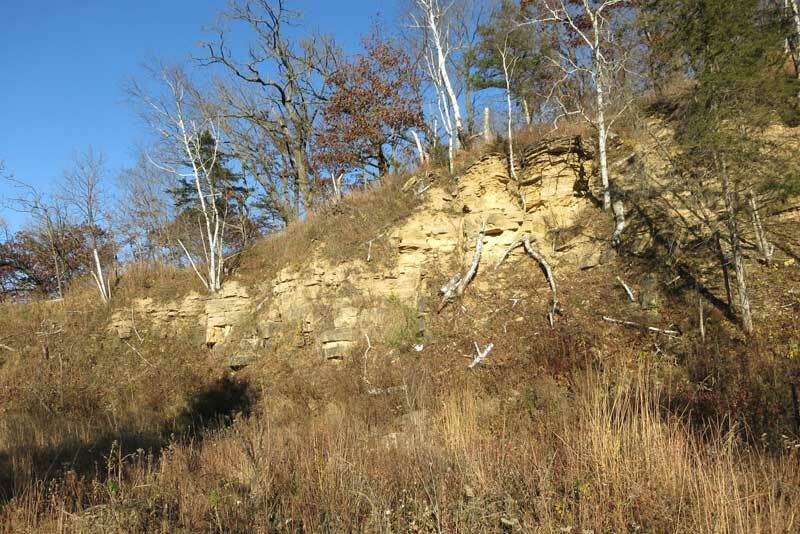 (See photo) The reason the Quarry exists is that about 50 years ago the Jordan Sandstone removed here was use to create Cedar Hill Lane, just across County F. The trail from the Quarry to County F follows the old road used to bring the rock down. The rock face consists of the Jordan Sandstone. See map above for location where this photo was taken. Geology is important in controlling the ecology of PVC. Because the bedrock is so close to the surface, it plays a major role in soil formation. Because the Oneota dolomite is rich in calcium and magnesium carbonates, its overlying soil is calcium/magnesium-rich and alkaline, making it favorable for calcophilic plant species such as buckthorn. Soils formed on the Jordan, well seen at the east end of PVC (the East Basin, especially) however, are quite acid, with pH values around 5.0 to 5.5.